"Listen," a brilliantly creepy and surprisingly meaning throwback to some of Moffat's more horror inspired solo outings. After last week's fun cheesefest, "Listen" throws us into the darkness corners of our worst nightmares. What is that sound of footsteps following closely behind? Why do we talk to an empty room? What causes the hair on the back of your neck to stand up when you know there is nothing behind you? That is exactly what the Doctor is trying to deduce. Peter Capaldi has firmly established his version of the Doctor after running the gamut from a Dalek episode, to a fun and wacky adventure, and now to a creepy journey into our darkest fears. 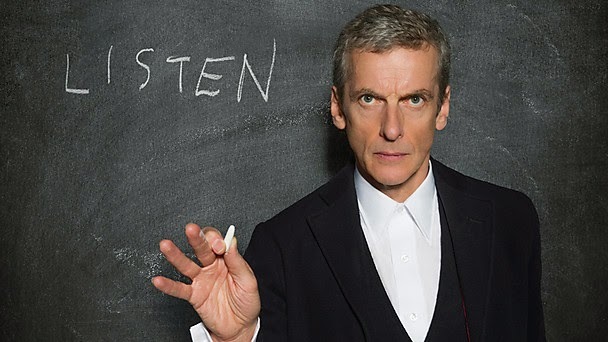 "Listen" features the perfect amount of bickering and grumpiness from the Doctor, while still giving him a curious side. Clara's character is further humanized with some very sweet and meaningful scenes in the episode; she really is perfect for Capaldi's Doctor. Danny Pink continues to be a surprisingly relatable and fun character, who is incredibly inept at holding a conversation. As always, the humor is spot on to balance out the darker, ominous tone. When Clara interacts with the TARDIS' telepathic interface to find her young self when she had the dream of someone grabbing her ankle, she is then distracted by a call from Danny Pink, and thus she is sent to the night that Pink, formerly named Rupert, encountered the mysterious creature. The entire scene with Clara and Pink under the bed when something sits on it is incredibly creepy and suspenseful. The following scenes with the trio trying not to look at it are very reminiscent of "Blink," in the best way possible. After the encounter, Clara's talk with young Pink is a nice and very well done exchange between the two. Clara is an almost motherly figure throughout the episode as she gives comforting advice, which is boostered by Jenna Coleman's brilliant performance. Later, Clara is taken back to her date with Pink to try and fix things, yet she lets it slip that she knows Pink's original name, which causes more conflict and awkwardness between the two. Surprisingly, the Doctor finds another person important to Clara's timeline, Orson Pink, who is a time traveler from earth 100 years in the future, and of course, Orson looks almost exactly like Danny (what’s up with the fro?). So, it would seem that Clara and Danny are destined to be together because Orson is presumably their great-great-great-grandchild. Also, was I the only one reminded of the Vastra Nerada when Orson in his spacesuit thing walked into the restaurant? Somehow, the Doctor ends up at the end of time of itself on the last planet remaining. With only one man left alive in the universe, what is banging on the door? Is it the pressure of the atmosphere or it is something far more sinister? That is exactly what the Doctor is trying to figure out. The last, albeit most controversial, part of the episode is when Clara encounters the Doctor as a child, who we originally believe to be Danny, and when it is revealed that the child is the Doctor, I am sure that I was not the only one with chills going down their spine. When Clara reaches out and grabs the Doctor's ankle, everything begins to make sense. Unfortunately, there will be a slew of angry old school Who fans that will be whining about Clara meeting the Doctor's younger self and giving him words of encouragement, which then flashes back to Hurt's War Doctor. However, the scene ultimately humanizes the Doctor by making him a scared child just like everyone else at one point in their childhoods, and no matter how much they want to complain, that was a powerful scene. One aspect that "Listen" captures perfectly is the universal feeling that someone is always watching. It is a fundamental feeling I am sure everyone, myself included, has felt at one point or another, and it is how the episode taps into our fears that makes the threat all the more profound. Moffat knows how to make the worst fears come to life in the simplest of ways, like the monster under the bedsheet. A certain portion of the credit goes to Douglas Mackinnon's direction of the episode, which is simply wonderful with a dark and eerie atmosphere. Another aspect that I have to give props to is the fact that Missy and the "Promised Land" are not even mentioned throughout the episode! Also, as a whole, the episode with filled with far too many meaningful metaphors and parallels between the Doctor and the brave soldier Dan to even discuss in one review. Overall: 9.6/10- "Listen" is a beautifully poignant and delightfully atmospheric masterstroke that brings out the best of Moffat's writing skill, and it is exactly what I have been asking for. As before, if you have reviewed the episode, please let me know and I will add it to the list of links. Gotta love the "No Hugging" rule.